Before relating what I found, however, a word about our guide is in order. Nguyen Chanh Trieu-or "Tango," as he liked to be called-had been an interpreter with the Marines throughout our war. Hence, the nickname "Tango," the phonetic alphabet designation for the letter "T," the phonetic alphabet being a simple system aimed at ensuring the accurate transmission of information despite the vagaries of radio reception and individual pronunciation and accent. Trieu was a university graduate who had studied French and English literature and who had planned to be a teacher. 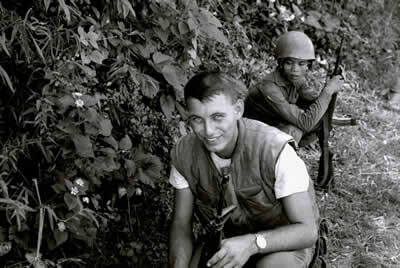 For reasons he never divulged, he enlisted in the Army of the Republic of Vietnam (the "ARVN") and was assigned as an interpreter to the Marines and, apparently, went on to accommodate himself to the Marine sensibility. I can't speak for Bill, of course, but Trieu's story impressed me as just one of a number of depressing reminders of all the sadness that lay just beneath the surface in the new Vietnam. Trieu himself, however, hardly seemed consumed by bitterness or self-pity. He said he had a wife, five children, and thirteen grandchildren, several of whom still lived with him and his wife in a small house in Danang. When he told me, after learning what I do for a living, that the highest paid professor in Vietnam makes about $40.00 a month, I realized that Trieu must have been doing fairly well by Vietnamese standards. Bill and I tipped him $50.00 for only four days' work, and other tourists probably ended up even more moved by his history than we were. "Tango" was a good guide-personable, thoughtful, and well-informed. He was also a prudent man. He did a great job showing us all manner of things that the authorities want tourists to see, and even a couple more. But, as Bill and I would learn, when it came to the one thing we had specifically come to see, our old "ville," his hands were tied. Regardless of when we actually started using defoliants in Quang Tri Province, the effects, according to Duy, have been horrendous. The statistics Duy trotted out made me realize that underneath his mild-mannered tour guide exterior lurks the heart of a party loyalist. At least 16,000 people in Quang Tri Province remain affected, he said. He further claimed to know one family in which five of seven children are paralyzed as a result of Agent Orange contamination. 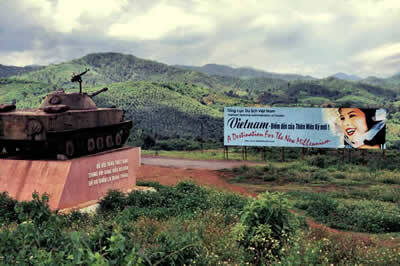 Similarly, according to Duy, there have been 5,500 land mine casualties throughout the province since the war's end. The numbers may be exaggerated, but the problems themselves do put an ironic spin on Duy and Trieu's translation of "Thon Vinh Dai," our village's name-"large village of tranquility and long life." And then I was back, after a hiatus of 34 years. I found it all difficult to fathom. I had expected it all to be terribly moving and to be swept with waves of nostalgia for the "way we were." Instead, I felt numb and even strangely dissociated from the experience. I suppose that was because I had always felt that we just didn't belong there in the first place; and the way things worked out, I really didn't feel any more welcome the second time around. There was that. And, also, the place we had been to in 1967, I realized, was more existential than physical. Every thing had changed in the interim. But, most importantly, we had too. Talk about not being able to go home again! Thomas Wolfe had nothing on us. Duy didn't seem to mind our loitering on the northern side of the river. We took a leisurely stroll along the river to the west. When we got to the new school, we noticed that one of the concrete posts to the fence that had surrounded the old churchyard was still standing. The top, however, was rough and had a couple of twisted iron rods sticking out of it. A crucifix had no doubt adorned it. Bill asked me how much farther I wanted to walk. We had come there with the half-baked idea of trying to retrace that December 4 th patrol route. Once we were there, both of us realized that too much had changed; we would never find the site of the ambush. Besides, it was hot, and wandering around in search of our past suddenly seemed a lost cause and an imposition on Trieu and even Duy. I told Bill that I was ready to go if he was. On our last evening in country, Trieu , who lives in Danang, took us to a little outdoor café where he often spent his evenings. I think it was there (it should have been there) that, his tongue loosened by our second or third round of beer, Trieu told us how unhappy he was about how the Americans, in the end, had simply abandoned the Vietnamese who had helped them. He urged us to write to former Marines like Chuck Robb and Oliver North. I didn't have the heart to tell him that neither Robb nor North had the influence to right the wrongs of the past. Still, it was pleasant sitting out on that sidewalk, talking and drinking beer and watching people coming home from work. Later, at the airport, I slipped Trieu and the driver envelopes containing their tips. Trieu hugged us both and wished us a safe trip back. We checked in and passed through security. As we were taxiing away from the terminal in the dark, I looked out at the lights of the terminal receding in the distance. It can't be the same terminal building, I realize, but something about it all seemed eerily familiar. The lights looked the same. The mixed feelings were similar. Just for a few seconds, thirty-four years seemed to slip away. I imagined that this was still Danang Air Force Base and that I was still young and leaving to go find my future. Edward F. Palm is a retired Marine Corps major turned academic (Ph.D. Pennsylvania). He has taught at the U.S. Naval Academy and at Glenville State College, in West Virginia, and has held dean appointments at Maryville University of St. Louis and Olympic College, in Bremerton, WA. He now teaches full-time online for Strayer University. He is also a lifelong, relentless amateur photographer.